Cleveland Browns training camp is just around the corner, and with it comes a major decision the front office may have to make regarding one of its star players. 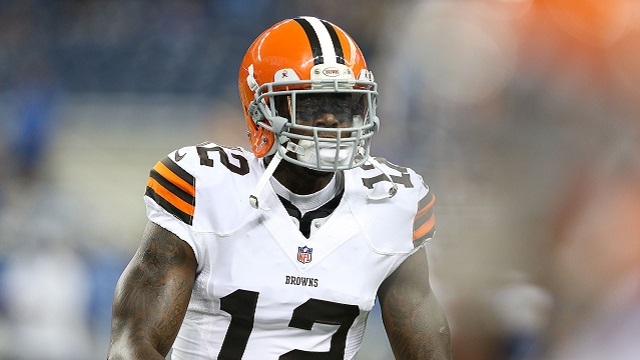 Wideout Josh Gordon, who hasn’t touched the field since 2014 due to suspensions, is up for reinstatement on August 1. He was initially given this opportunity back in April, but another failed drug test postponed his chances of rejoining the Browns. Today, it was announced the Pro Bowl receiver met with NFL commissioner Roger Goodell regarding his potential return. It’s quite a significant development, as Gordon wasn’t given this opportunity back in April. There’s a chance his getting to meet Goodell bodes well for his odds of getting reinstated. If Gordon is indeed allowed to play, we’re still not sure if he’ll do so in Cleveland. The Browns have been noncommittal about his status for months now, giving no indication as to whether or not they’d welcome him back. Should Gordon actually get reinstated, Cleveland has to decide whether or not there’s a spot saved for him in the locker room. There are legitimate reasons to keep him, and there are just as many to cut him. It goes without saying the Browns have an incredibly difficult decision coming regarding Gordon’s future. The reasons for keeping the stud wideout are pretty simple. We’re talking about a player who broke league records in 2013 despite missing two games joining a Cleveland team lacking talent across the board. New quarterback Robert Griffin III will need as many weapons as possible if he wants to rejuvenate his career, and having someone like Gordon to throw to will certainly help the cause. At the same time, the negatives Gordon brings are just as obvious. Again, he missed the entire 2015 season after yet another suspension. Asked to prove he could be trusted, Gordon instead spent much of the offseason hanging with Johnny Manziel, Cleveland’s other former problem child. Toss in his failed test from April, and you can see why the front office would have trouble believing it can rely on him. One thing which may have hurt Gordon’s chances of coming back to the Browns was the way the team handled this spring’s draft. Cleveland loaded up on receivers, selecting four overall and significantly crowding the wideout depth chart. Where Gordon’s chances increased when the Browns were lacking in receiver help before the draft, the team is no longer in dire need at this position. Not only has an influx of wideouts hurt Gordon’s chances, so has the change in culture being ushered in by new coach Hue Jackson. All reports indicate Jackson has been significantly shifting the environment in Cleveland, weeding out red flags and ensuring everyone on his team is going to give maximum effort. He doesn’t seem the least bit interested in taking on players with character concerns, ousting Manziel the second the opportunity was made available. However, can an exception be made for Gordon? In order for that to be the case, the wideout will have to go to great lengths to prove Jackson can trust him. He has strong support from Cleveland legend Jim Brown, who claims he’s spoken to Gordon a couple times and feels good about his progress. At the same time, can Gordon give the maximum effort required from Jackson? Is he done loafing through routes both during practice and in games? Is he finally going to stay clean? As you can see, the Browns are facing one heck of a conundrum when it comes to Gordon and his place on the team. His addition would be huge, but it’s been a long time since he’s proven trustworthy. Don’t get me wrong, a starting receiver pairing of Gordon and Corey Coleman sounds potentially devastating. It wouldn’t turn Cleveland into a playoff team, but it would certainly speed up the rebuilding process. That is, of course, if Gordon doesn’t have another run-in with league discipline. Obviously, this is all moot if he fails to get reinstated. That said, if he indeed finally gets the green light, Cleveland has to think long and hard about whether or not he can be a part of the team. It’s no easy call, and it’s one I’m glad I don’t have to make.